I am, with certainty, not someone to talk to you about chasing your dreams. But I still am going to, anyway. Not going to lie, I am in a constant battle with myself everyday when I wake up and I think about the things I didn't do. Like you, I have many dreams and I want to achieve/fulfill all of them. I am, in fact, trying my very best to believe in myself that I can achieve them. But sometimes, reality can be so harsh. There are days when I get torn between pursuing a job that can make good money and one that makes me happy, and there are also days when I realize, that maybe I am not that fortunate to choose. So if you are fortunate enough (because you have good grades) make sure to choose your career wisely! Money maybe everything, but sometimes it's not everything. Money cannot buy you happiness (true to a certain extent). Meh, what am I saying? All in all, I am torn between a lot of things. My mind is like a whirlpool and my future is well... I want to do something about it, rather than lament about it all day and night. But I just don't know what to do, if only I knew. When I first started photographing the Moon, I never expected myself to do this. It was more like, why not let's give it another go, and shoot it at better quality this time? Then when I accidentally shot Jupiter, it made me feel more determined, and now I am going to attempt to shoot Jupiter's 4 largest and brightest moons. A bit overambitious? After awhile, I received so many positive comments from all of you, and it made me feel better about what I was doing. I had a friend who texted me, telling me about how I've inspired him to pursue his dreams of being in the fashion industry (Tem, are you reading this?) and that made me feel even better! I honestly didn't shoot the Moon just because I wanted to be 'popular' or inspire others, I shot it because I wanted it so badly. I can't say that I love Science, but I love astronomy/universe/planets etc. and the boulder between me and studying astronomy would be my grades, of course. But it's not like it's the end of the world, I could do astrophotography (right now, I'm an amateur) which is a combination of two things I love. I wish that I had found out sooner about what I wanted to do in life, so I could work hard and achieve it. But what's past is past now, and all I can do is hope for a better future. 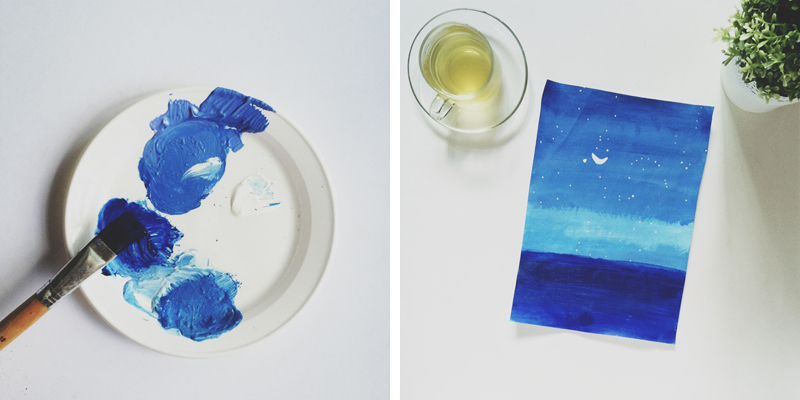 I am definitely not artistically inclined or an astronomer, but I couldn't help but paint the night sky. "And all the teachers used to teach, you can do anything if you put your mind to it. We put our minds to it all, but disappointment crashed the ball. We could have done anything but we just never quite knew it." Painted this last week. Constellations pictured here: Part of Perseus, Aries, Auriga, Gemini, Eridanus and Monoceros. Jupiter is on the bottom left of the Moon, and Taurus (the one that makes it look like a smiling face) is right above. Orion is on the right of the moon. Thank you again, for taking time to read this post of mine. I hope that you find out what you want to do in life sooner, and work towards that goal.